Wouldn’t suggest you use TUNE CARD for PAYPAL.It’s not meant for it..because of the BIN does not even belong to them. Researched it…and found it belongs to SRS CARDS in Italy… so…up to you. What do you mean by because of the BIN? Just want to ask why until now i havent receive the money that paypal taken to my Tune Card.Its been a month since they deducted it. Really, have u checked your statement online. BIN is acronym for Bank Identification Number. The first 6 digits from debit/credit card number are used to identified which bank belongs to. I’ve added my Tune Card to paypal, but paypal wants me to insert confirmation code from the transaction with paypal, I’ve checked my Tune Card transactions but the transactions details are not shown even my balance is decreased (paypal takes $1.++ and return back after I’ve confirm my card). How I’m going to verify my paypal? How I’m going to get the confirmation code? How long until you able to see the 4 digit? It is 2 days now. The card balance already deducted but I still can’t see any transaction for paypal below “View Transaction” menu. Sorry previous image is invalid links, ha ha ha, copy and paste errors here is the links for the image click here as you can see it’s only showed my initial load and fee charge, but the paypal confirmation charge ($1.95) were not shown even it has been deducted, it has been 2 days after I’ve trying to confirm my Tune Card. How many days it takes to view the transaction details? By the way, great blog! Thanks for sharing and caring…. I am not sure how many days it takes, but not more than 3 days I think.I dont see any problem actually using Tune Card to verify PayPal. Anyway Sabre why did PayPal freeze your friend’s account ? At last, I’ve receive my confirmation code and it takes 3 days after I’ve add Tune Card to my PayPal account. Thanks anyway for your help lankapo, thanks for your information and explanation. I don’t know why PayPal freeze my friends account, but as he said to me (if he not lying) the reason is because he not verify his PayPal account for a very long time, about 1 year and he has $20 balance, to retrieve it, he needs to send PayPal a copy of his License, then he scan his driving license and attached to PayPal and got back his PayPal account, I’m going to promote this Tune Card to him, well, I’ve tried to transfer $50 from my PayPal to Tune Card, how many days it would take? how i would like to pay the first-time RM50 using cimb online.. I agree with you, if you use PayPal then it will be no problem.But Google Adsense only provide either cheque or Western Union. easy actually, just choose to top up using PFX online. My online income sources is Google Adsense and Adbrite, and I also get some income from Adengage which will pay me through PayPal. I’ve earn about $113 after 5 months and I don’t like shopping online, that’s why I need to find a way to cash out my PayPal money, thanks to you for informing this options, before this, I’ve applied Public Bank Debit Card but PayPal said they can’t verify it because PB Debit Card using Visa Electron. Also thanks to this Tune Card now I’m verified member of PayPal. Sorry for bother you again lankapo, I want to ask since you’re the experienced person, can we change our Tune Card pin number? I’ve sent mail to Tune Money CC but seems they mailbox is full and my mail get bounced, I wanna try at CIMB ATM but nearest CIMB at my place is about 15km from my home. I did not know plak, Public Bank Db tak leh verify PayPal mm new info ni. Wah in 5 months already got USD 113, Ok watt. of course i have register with tunemoney. but the problem is i could not find the reload money under tune card. i dunno why i cant notice any link for reload money. well…with tunemoney we can withdrawal our money from paypal..
so how to get the money?is it juz go to ATM and take the money? welcome to my blog. easy squeasy lah. After u have cash out the money from PayPal to Tune Card. Go to CIMB ATM machine, insert your Tune Card,use the pin number that they give you. That’s all. Like any other ATM card. CIMB will charge about 50 centsfor each withdrawal. Other Bank, more than RM 10.
haha ok lah tu..klu nak cash kuar kan lah kat CIMB. But if you want to use the card for shopping also no problem. just wanna ask some q, does MOL Eon bank debit card which i bought from 7E accepted by Pay Pal. thnx again anyone.. I am not sure because never try it . Why don’t you try to verify PayPal using MOL Eon Bank? But I think I have read somewhere you can use it for PayPal. I want to share some bad experience in dealing with Public Bank Berhad… 2 months ago, I’ve deposited my online income cheque (foreign cheque) in my Public Bank saving account, normally, after about 1 month, I can withdraw the money to pay my monthly bills as usual I’ve done before, but this time, it has been 5 weeks and I still didn’t receive my money in my account. hi…. im James. I hope to be able to purchase pc softwares from overseas not available locally in Malaysia pc shops. So, if i have a Tune Money prepaid card….n Paypal account…..can i purchase the products online ( i.e. once they receive the payment, they will send me the activation code for the porduct online)….so lets say the product cost US $50…..how much it will deduct from my Tune Money Prepaid Card ? Note : I am using Tune Money prepaid card mainly for purchase payments. 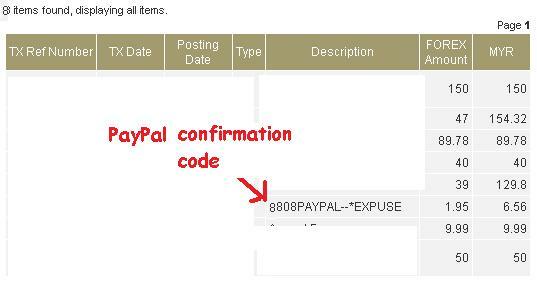 So, I hope Paypal will accept it…..y dont some merchats use other methods of paymets……thanks for your help…. @ James – Welcome to my blog :). One thing you should understand, you can cash out your PayPal money to Tune Card but you cannot top up your PayPal money from Tune Card, get it. Hi guys.To James.Recently Ihad purchased an ebook directly from US.Fortunatey that this publisher registered with Clickbank.So,after my payment was approved,immediately I get the download link.Do you know with what I use to make the payment methode? With Tune Money card.I would like to reaveal the easiest way to make money from internet.Please register at Clickbank along with your Paypal email but please make sure that your account with Paypal is in status VERIFIED.Anyway I wish all the best. Public Bank RM24??! wa…may I know what is that mean? annually? I forget I dint really read the brochure, if not mistaken, is they want you to use at least …erm..certain amount, then the charges can be waived right? wa…dun scare me o..I going to cancel the card if need annual rm24..
ya…i throw the brochure d..hehe..if not mistake can be waived one …so far Public Bank service is very good for me. I just receive my Tune card last week. Although I find it a little bit troublesome, but I apply this card is only use for online purchase. @ mahira – sorry to hear that. As you can see a lot of us have successfully link our tune card with PayPal. Have you activate your Tune Card? How much balance do you have in your Tune Card ? Make sure it’s more than RM 20 . Since PayPal will charge you USD 1.95 during verification and return back your money. So just top up RM 50.
hello, i’m in nigeria, i need money paid into my nigeria cash card via GLO FIRST card, is this possible and how long will it get into my cash card? How long does it takes before the tune card delivered to the stated mailing address? I wish I could help. I am not sure how long it takes now. They are using poslaju now so should be 2 3 days. Currently i use maybank debit card to cash out my paypal money.